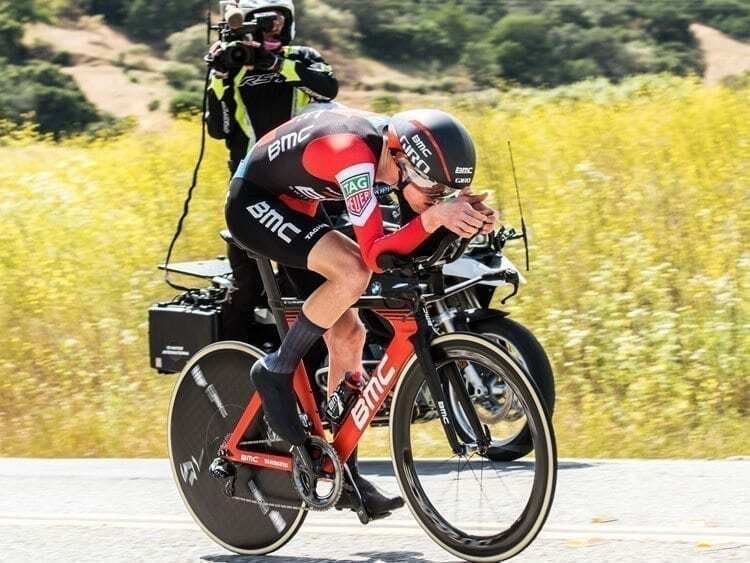 BMC Racing Team’s Tejay van Garderen (Tacoma, Wash.) rocketed to a decisive stage victory and the overall race lead at the Amgen Tour of California individual time trial in San Jose / Morgan Hill today. Van Garderen began the day in 8th place overall, exactly one minute behind the race leader Egan Bernal, Team Sky’s 21-year-old Columbian rider. Van Garderen, who picked up two Grand Tour stage wins in 2017 at the Giro d’Italia and the Vuelta a España (Time Trial stage), made up that minute and more on the 21.6-mile loop, causing the Amgen Race Leader Jersey to change hands to the third owner since the race began on Sunday and extending his lead 23 seconds over Bernal, now second in the overall standings. “Today was special motivation… I had my girls here, I had memories here from five years ago. I didn’t expect it to go quite this well but I kind of had it in the back of my mind on Gibraltar if I can keep it to within a minute, I can maybe take it today. Today was going to be my big power play, and I’m glad I was able to produce one. It feels great,” said van Garderen, who won the 2013 Amgen Tour of California and the Time Trial stage that year. Stage 4 presented by TAG Heuer in San Jose / Morgan Hill featured cyclists racing the clock one by one on a looped course that featured one moderate climb. The gusty day blew apart the leader board with other shakeups including BORA-hansgrohe’s Rafal Majka (POL) dropping from 2nd to 6th place in the overall (+1.29”) and Mitchelton-SCOTT’s Adam Yates (GBR) sliding from 3rd to 5th (+1.07”). 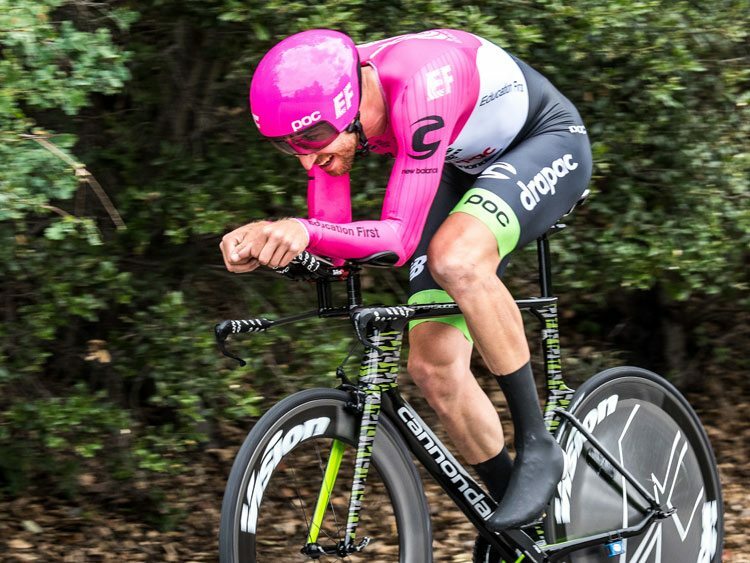 Team EF Education First-Drapac p/b Cannondale’s Daniel Martinez (COL) rose from 6th to 3rd (+.37”) and Bernal’s teammate Tao Geoghegan Hart (GBR) climbed from 11th to 4th (+.52”). Bernal retains the Visit California Sprint Jersey, the Lexus King of the Mountain Jersey and the TAG Heuer Best Young Rider Jersey for the third day. Riders in good standing still have to defend their positions over the next three stages, including the grueling Stage 6 and the HC climb up Kingsbury Grade. Tomorrow’s Stage 5 presented by Visit California begins in Stockton. Sprinters should flourish on the 109.7-mile fast and flat stage to finish in Elk Grove, where the Amgen Tour of California Women’s Race empowered with SRAM kicks off with the first of three race days. The 2018 edition of America’s premier cycling stage race covers 645 miles of roadways, highways and coastlines during seven stages from Long Beach to Sacramento May 13-19, while the Amgen Tour of California Women’s Race empowered with SRAM, showcasing the world’s best women cyclists, runs concurrently May 17-19, covering upward of 187 miles over three stages. The annual professional cycling events are the only U.S. races on the UCI WorldTour calendar and continue to attract some of the most renowned cyclists and teams in the world. Returning as title sponsor for the 13th consecutive year, Amgen, a biotechnology company in the race to dramatically improve patients’ lives, is proud to sponsor the Amgen Tour of California. Leveraging its title sponsorship of the Amgen Tour of California, Amgen is raising awareness and connecting with patients through its Breakaway from Cancer® and Breakaway from Heart Disease™ initiatives.